The walls and fotifications of Salzburg were mostly built in the early 17th century, when the 30-Years'-War waged in Central Europe. The construction was done with a hasty, but lasting effort. 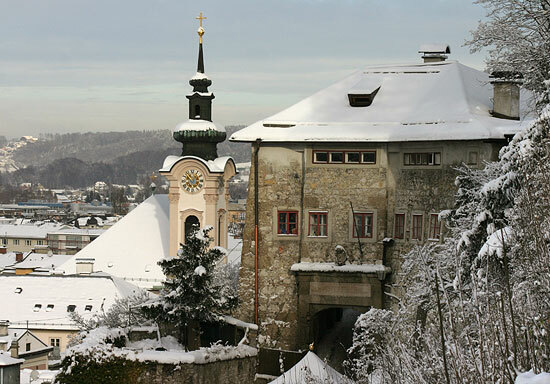 Especially the hills of Salzburg were heavily fortified with walls, bastions and gates that are often still preserved. In this case, a gate at the Kapuzinerberg (the hill on which you will find the Capuchin Monastery) was later transformed into a residential house. Pope John Paul II stayed here once on a visit to Salzburg. Another tower can be found on the other side of the hill: The Franziskischklössl is a popular hiking destination. In the background, you can see the church St. Sebastian, famous for its 17th-19th century cemetary.